Most products we buy these days have a warranty, but let’s face it: few of us keep track of our purchase and warranty data. If something goes wrong with a product, we scramble to find the warranty terms, receipt, and other necessary info—assuming we even remember there’s a warranty. Warranty Hero is a simple program that aims to fix the problem of lost or forgotten warranties by providing you with an easy way to keep a record of purchases and warranty data. You just click on Add; enter information about the item (brand, product name, purchase date, price, and serial number); and indicate the length of the warranty. If you’d like to be reminded when the warranty is about to expire, check the Remind Me box and the program will create an iCal event on that day using iCal’s default alarm setting. If you want to spruce up your entries, you can drag an image of the product (from the vendor’s Web site, a Web search, or a photo you’ve taken) into the image field of the record. You can even use your Mac’s iSight camera or Webcam to take a photo of the item. To avoid paper clutter, you can drag an image of an item’s receipt right into its record. PDFs of online receipts are especially useful here, but you can also scan paper receipts. 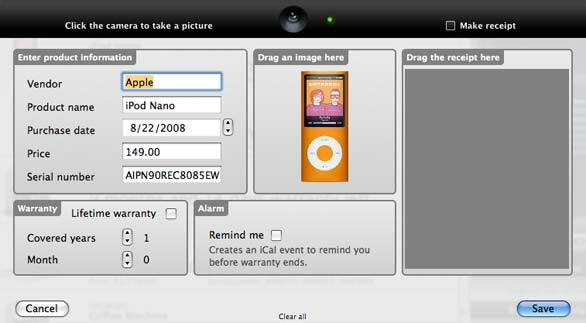 If you don’t have a scanner, Warranty Hero lets you use your Mac’s camera to take a photo of the receipt, although the quality obviously won’t be as good. You can zoom in to get a better view of a receipt or print the receipt with a click. If you ever have to file a warranty claim, you’ve got a complete record of everything you need to do so. 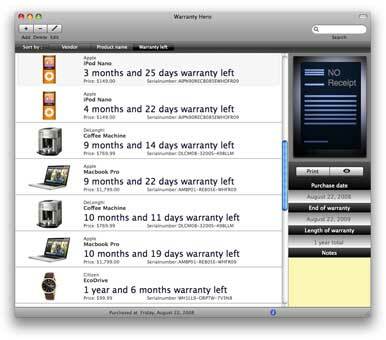 But Warranty Hero is also useful for tracking which warranties are due to expire soon; one of the sort options for the program’s item list is “warranty left.” Selecting an item in the list displays, to the right, a quick summary of the purchase date and warranty end date. You can also enter formatted notes about the item; these notes, along with most other data fields, are searchable using Warranty Hero’s Search function. If you ever need to work with your data in another program, you can export it in comma-separated-value (CSV) format. You can also export a PDF summary. Alternatively, if you’d like to track expiration dates on prescription and over-the-counter medications, you can use Warranty Hero’s reminder feature to nudge you when you’re due to refill. And the program makes a useful database of household belongings for insurance purposes, although the lack of a category feature (to assign items to and view them by categories) is especially limiting here.